These are our new baby kittens! 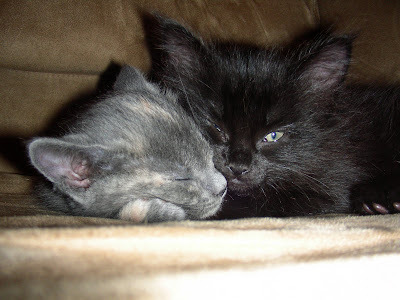 The black one is Morticia (I call her Ishee) and the gray one is Wednesday (I call her Nes.) They are sisters and so much fun. They love each other but really love to fight with each other! They usually race around the apartment as fast as they can and then turn on each other and hiss and pounce. It's funny but definitely gets on my nerves sometimes! 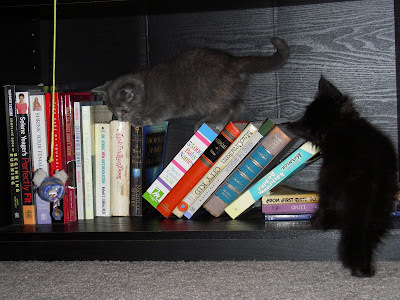 They love to climb all over everything especially our bookcases and the couch! This is how they like to sleep, curled up on us. Ishee is much more of a cuddler than Nes is. Ishee likes to climb on us just to be petted but Nes usually only cuddles right when she is about to fall asleep. Nes also likes to climb up on Pauly's shoulder and sleep there. It's so cute! 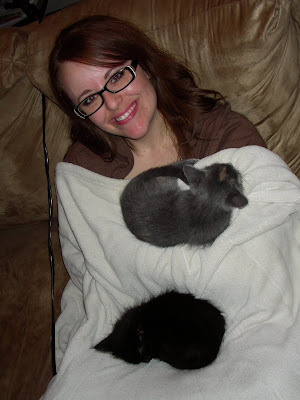 We love them and Pauly is so happy that I finally gave in and let him have pets. I'm happy that he is happy!